Customer Service Team Lead responds to phone calls or emails and resolves to all non-technical service requests of the customers. 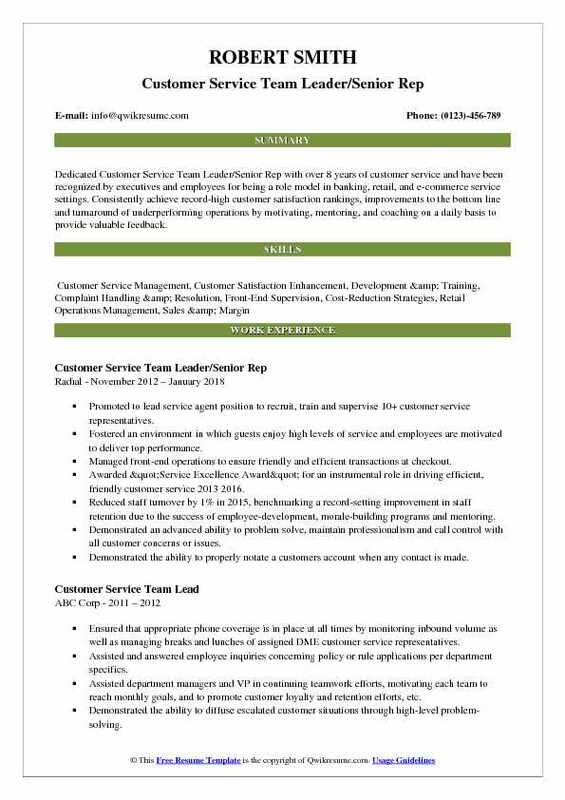 The Customer Service Team Lead resume describes the following job duties: responding and resolving escalated issues from customers, monitoring daily workflow, ensuring correct procedures are adhered, identifying system improvements, workflow improvements, and enhancing team efficiency. 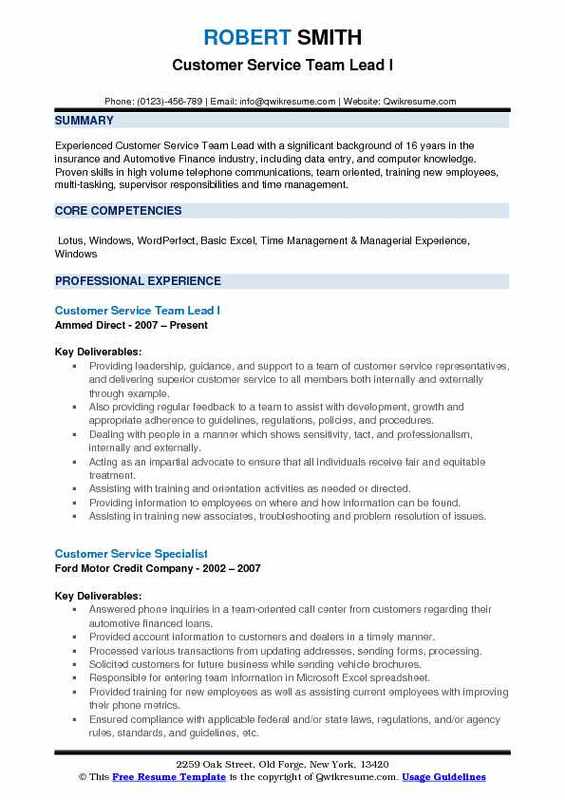 The customer service team lead also needs to coach and assist the less experienced team members and assist the managers in scheduling works. 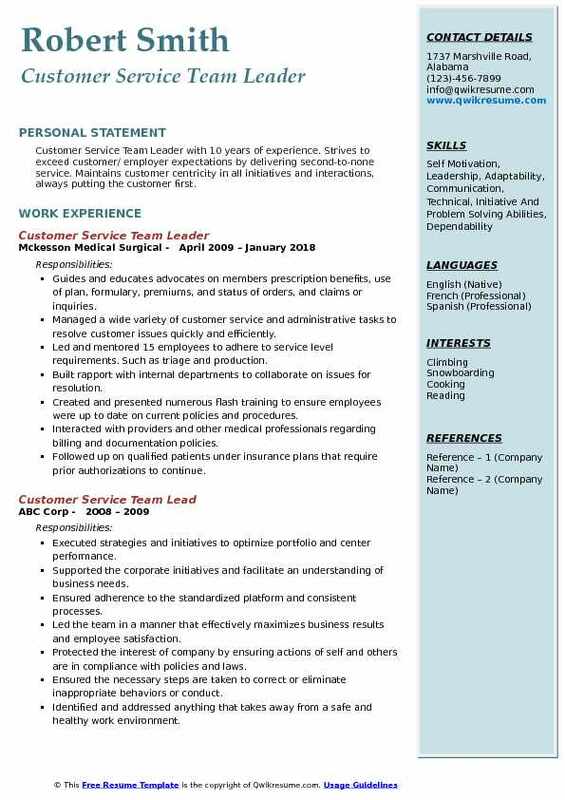 The most sought-after job skills for this job are product knowledge, industry experience, customer service skills, interviewing skills, result-oriented approach, leadership skills, sales skill, strong relationship building skill, proficiency in CRM software and performance management competencies. A High School diploma or a GED is mandatory for this job post. However, an associate degree with a few years of customer service experience is considered a major plus. 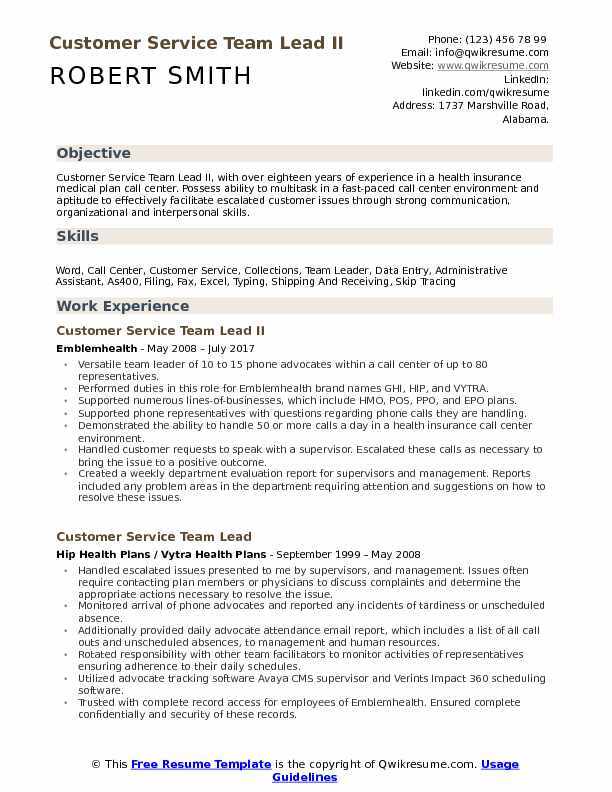 Summary : Customer Service Team Lead II, with over eighteen years of experience in a health insurance medical plan call center. Possess ability to multitask in a fast-paced call center environment and aptitude to effectively facilitate escalated customer issues through strong communication, organizational and interpersonal skills. Versatile team leader of 10 to 15 phone advocates within a call center of up to 80 representatives. Performed duties in this role for Emblemhealth brand names GHI, HIP, and VYTRA. Supported numerous lines-of-businesses, which include HMO, POS, PPO, and EPO plans. Supported phone representatives with questions regarding phone calls they are handling. Demonstrated the ability to handle 50 or more calls a day in a health insurance call center environment. Handled customer requests to speak with a supervisor. Escalated these calls as necessary to bring the issue to a positive outcome. Created a weekly department evaluation report for supervisors and management. Reports included any problem areas in the department requiring attention and suggestions on how to resolve these issues. Additionally provided performance appraisal comments on individual representatives, detailing observations of positive performance, opportunities for improvement, and specific details of supervisor calls taken for the week. Summary : Experienced Customer Service Team Lead with a significant background of 16 years in the insurance and Automotive Finance industry, including data entry, and computer knowledge. Proven skills in high volume telephone communications, team oriented, training new employees, multi-tasking, supervisor responsibilities and time management. Providing leadership, guidance, and support to a team of customer service representatives, and delivering superior customer service to all members both internally and externally through example. Also providing regular feedback to a team to assist with development, growth and appropriate adherence to guidelines, regulations, policies, and procedures. Dealing with people in a manner which shows sensitivity, tact, and professionalism, internally and externally. Acting as an impartial advocate to ensure that all individuals receive fair and equitable treatment. Assisting with training and orientation activities as needed or directed. Providing information to employees on where and how information can be found. Assisting in training new associates, troubleshooting and problem resolution of issues. Assisting in creating and maintaining training completion records for all team members may assist and answer employee inquiries concerning policy or rule applications per department specifics. As needed, assisting with inbound calls to ensure appropriate response time to customers needs are met. 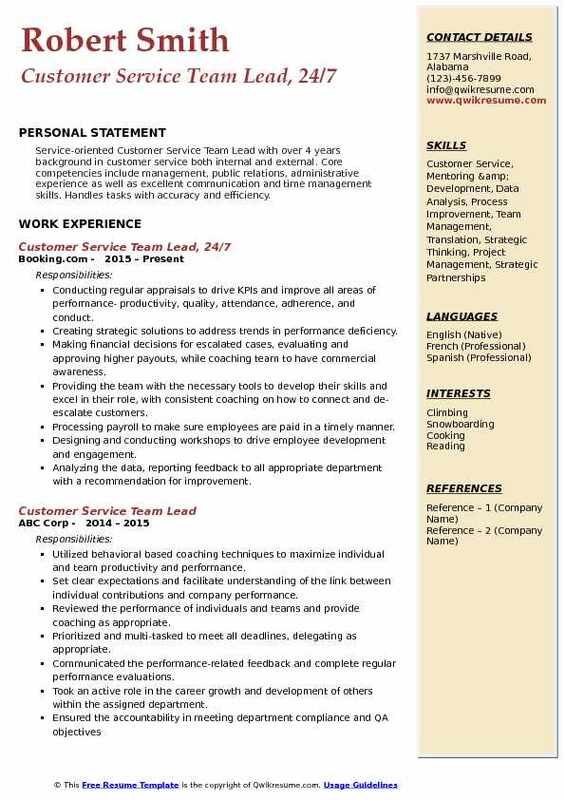 Summary : Dedicated Customer Service Team Leader/Senior Rep with over 8 years of customer service and have been recognized by executives and employees for being a role model in banking, retail, and e-commerce service settings. Consistently achieve record-high customer satisfaction rankings, improvements to the bottom line and turnaround of underperforming operations by motivating, mentoring, and coaching on a daily basis to provide valuable feedback. Promoted to lead service agent position to recruit, train and supervise 10+ customer service representatives. Fostered an environment in which guests enjoy high levels of service and employees are motivated to deliver top performance. Managed front-end operations to ensure friendly and efficient transactions at checkout. Awarded "Service Excellence Award" for an instrumental role in driving efficient, friendly customer service 2013 2016. Reduced staff turnover by 1% in 2015, benchmarking a record-setting improvement in staff retention due to the success of employee-development, morale-building programs and mentoring. Demonstrated an advanced ability to problem solve, maintain professionalism and call control with all customer concerns or issues. Demonstrated the ability to properly notate a customers account when any contact is made. Communicated with other departments on behalf of customers to resolve customer issues, effectively communicate appropriate charges, company policies, and/or procedures as determined at the time of the call. Summary : Highly motivated Customer Service Team Leader/Senior Rep with strong client relationship building skills and excellent organizational skills. Provides customers with optimal products and services to meet their specific needs. Strong compliance and on-boarding experience. Bilingual speaker of English and Spanish. Responded and resolved customer telephone inquiries regarding IDT products and services by staying up to date with new and old programs offered to our customers. Built strong working relationships and liaise with internal and external departments including client service, sales, credit, legal and other operations teams to obtain the necessary documentation to meet internal account opening guidelines and requirements. Ensured that all customer information obtained is consistent with company policy and procedures and satisfies requirements. Ensured that all requests are prioritized, resolved within agreed timeframes, work-flow pipeline optimized, priorities identified early and issues escalated accordingly. Demonstrated the ability to identify training needs and develop staff to improve performance. Demonstrated strong analytical ability through the review and analysis of daily, weekly and monthly performance, production and statistics reports. Through coaching and counseling sessions maintain and improve all areas of performance; productivity, quality, and attendance. 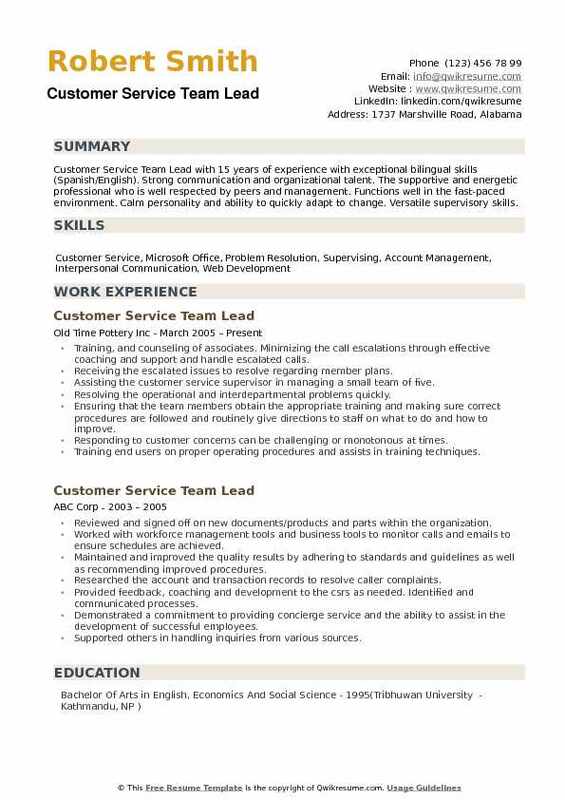 Summary : Customer Service Team Leader with 10 years of experience. Strives to exceed customer/ employer expectations by delivering second-to-none service. Maintains customer centricity in all initiatives and interactions, always putting the customer first. Guides and educates advocates on members prescription benefits, use of plan, formulary, premiums, and status of orders, and claims or inquiries. Led and mentored 15 employees to adhere to service level requirements. Such as triage and production. Built rapport with internal departments to collaborate on issues for resolution. Created and presented numerous flash training to ensure employees were up to date on current policies and procedures. Interacted with providers and other medical professionals regarding billing and documentation policies. Followed up on qualified patients under insurance plans that require prior authorizations to continue. Summary : Senior Customer Service Team Lead seeking a position that will take advantage of my acquired skills and customer service experience to ensure high-quality performance, while positively influencing company operations and results. Thorough understanding of all organizations products, services, procedures and guidelines and the ability to disseminate information to customer service representatives. Identified development opportunities using quality assurance and provide ongoing training, coaching and mentoring on an as-needed basis. Conducted weekly huddles and engaging both in-house and remote team members via bluejeans conferencing and/or GoToMeeting. Cross-trained to Medicare and supported AEP by monitoring team to ensure contractual requirements set by cms are met. Managed call volumes and maintained service level agreements by making sure all customer service representatives are available and ready to take calls. Monitored calls by listening in randomly to provide real-time coaching and reinforce positive behaviors. Selected as a health care authority inquiry coordinator back-up to provide coverage as needed to resolve urgent issues in a timely manner. Maintained professional relationships with cross-functional departments and worked closely with them to resolve escalated issues. Partnering with SM/ASM to achieve financial results and operational targets by driving sales and effectively managing the Store resources. Ensuring daily execution of Peets playbook and meeting all operating standards. Coaching, training, and demonstrating service, quality, and operational standards to the team. Supporting the team member development and performance by training and providing. Engaging the team members to work toward achieving store goals and targets. Support recruiting and hiring efforts of high caliber, customer-focused team members. Partnering with individual team members to develop skills in a specific area. Create ensuring that team member responsibilities were defined and understood. Ensuring the deliverables were within budget, on schedule, and of superior quality. Planning, coordinating and controlling the daily operations of the organization. Objective : Customer Service/Team Lead with 4 years of experience dedicated to effective team management and customer satisfaction. 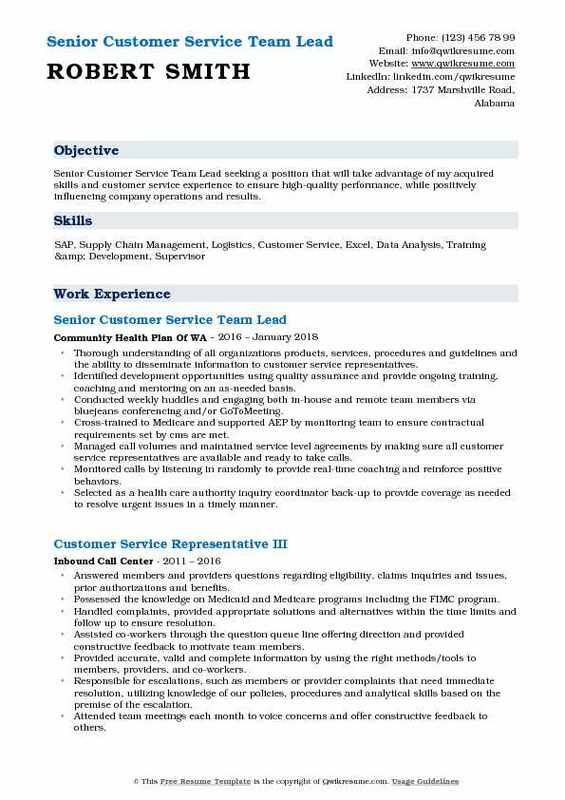 Dynamic Customer Service Manager who leads diverse teams to achieve company goals. Exceptional customer care professional who addresses inquiries and resolves problems as they arise. Skills : Microsoft Office, Office Administration, Typing, Shipping, Receiving, Logistics, Office Sales, Calculators, Forklift Operator, Pallet Jack Operator. Coordinating the unit call center operations and activities with call center Supervisor while monitoring the performance and providing feedback and/or coaching of staff. Performing the routine QC reviews of call center staff to help improve operations. Assisting in managing inbound and outbound calls that are routine in nature by answering inquiries, clarifying information, researching, locating, and providing relevant information. Monitoring the performance and provide feedback and coaching of staff to improve performance (perform QC evaluations). Managing inbound and outbound calls that are routine in nature, answer inquiries by clarifying information, researching, locating, and providing relevant information. Following procedures and scripts, using fundamental knowledge to navigate information systems and/or CRM system(s). Assisting the team members in maintaining and collecting sensitive case documents to ensure service level standards are met, or exceeded, and monitoring the training and process needs of staff to support customer needs. 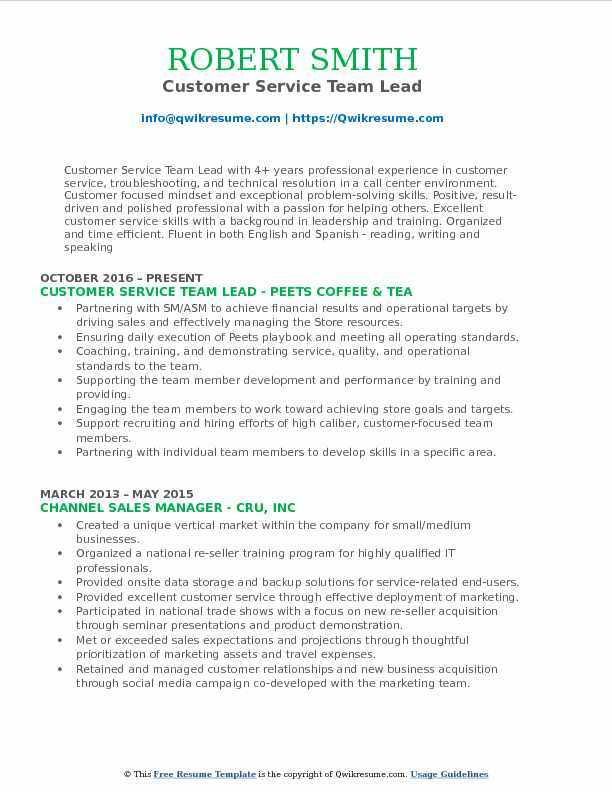 Objective : Service-oriented Customer Service Team Lead with over 4 years background in customer service both internal and external. Core competencies include management, public relations, administrative experience as well as excellent communication and time management skills. Handles tasks with accuracy and efficiency. Conducting regular appraisals to drive KPIs and improve all areas of performance- productivity, quality, attendance, adherence, and conduct. Creating strategic solutions to address trends in performance deficiency. Making financial decisions for escalated cases, evaluating and approving higher payouts, while coaching team to have commercial awareness. Providing the team with the necessary tools to develop their skills and excel in their role, with consistent coaching on how to connect and de-escalate customers. Processing payroll to make sure employees are paid in a timely manner. Designing and conducting workshops to drive employee development and engagement. Analyzing the data, reporting feedback to all appropriate department with a recommendation for improvement. Monitoring the phone calls and emails to measure quality, and make recommendations for improvement. Partnering with training and quality to deliver my findings and turn them into actionable training opportunities. 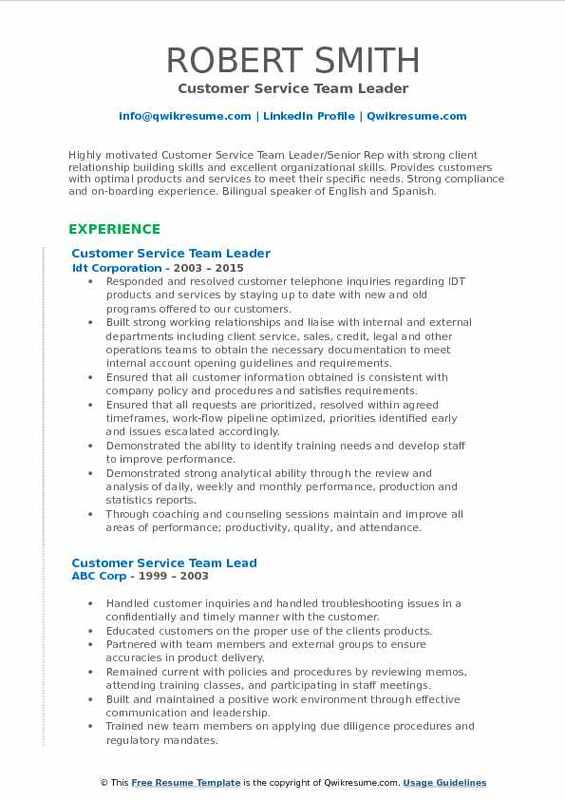 Summary : Customer Service Team Lead with 15 years of experience with exceptional bilingual skills (Spanish/English). Strong communication and organizational talent. The supportive and energetic professional who is well respected by peers and management. Functions well in the fast-paced environment. Calm personality and ability to quickly adapt to change. Versatile supervisory skills. Training, and counseling of associates. Minimizing the call escalations through effective coaching and support and handle escalated calls. Receiving the escalated issues to resolve regarding member plans. 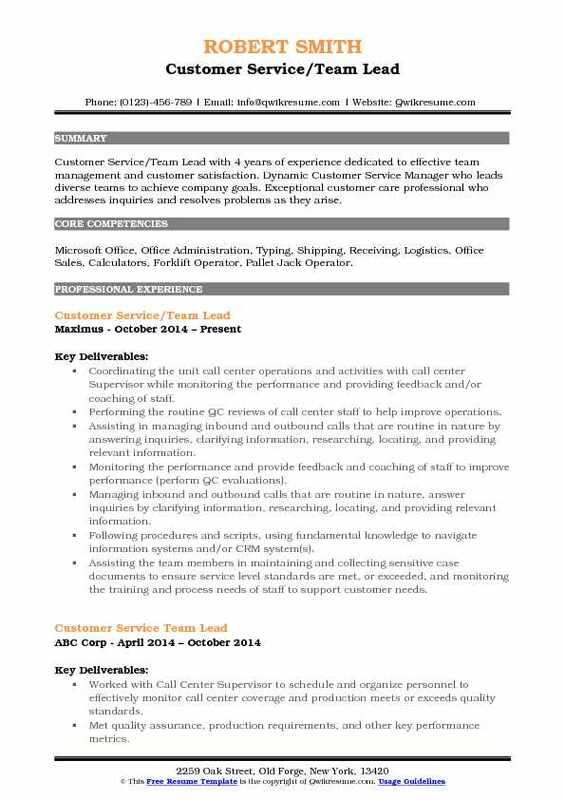 Assisting the customer service supervisor in managing a small team of five. Resolving the operational and interdepartmental problems quickly. Ensuring that the team members obtain the appropriate training and making sure correct procedures are followed and routinely give directions to staff on what to do and how to improve. Responding to customer concerns can be challenging or monotonous at times. Training end users on proper operating procedures and assists in training techniques. Assisting the Marketing Manager with the creation of user/owner manuals, the creation of parts manuals, order forms, and literature.